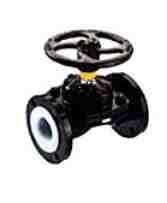 We are reckoned as one of the major Manufacturers, Exporters and Suppliers of PFA Lined Diaphragm Valve. Our self cleaning design PFA Lined Diaphragm Valve is highly acclaimed for better throttling flow or block flow. PFA Lined Diaphragm Valve is the best choice for dirty, contaminated and powder media. The quality and functionally of the diaphragm are crucial for greater fatigue strength under reversed bending stresses and dimensional stability even after many switching cycles and at fluctuating temperatures. Moreover, our PFA Lined Diaphragm Valves are suited to handle erosive and abrasive application. Our PFA Lined Diaphragm Valves have high density and low permeability. When require to the replacement of the Diaphragm, the bolted bonnet design permits the dismantling of the valve without removing the valve body from the pipe joint. Convection Isolating valve would require expensive exotic materials to resist the effects of sever corrosion. Leakage Class : as per Class VI shut off.